Sow mid-March to mid-April in prepared seed bed. Transplant mid-May to mid-June. 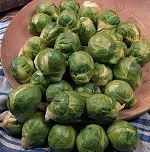 New variety with a long harvesting period from November so perfect for Christmas. Good disease resistance and mild sweet taste. Clubroot resistant mid season variety harvesting from November to early December. Early variety that can be sown and harvested later. Well flavoured, sweet, dense buttons. Not quite a sprout and not quite a kale but a combination of the two! Kale 'florets' on a sprout stalk in green, purple and green/purple. 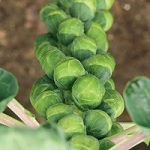 Grow as a mid-season sprout. Old favourite open-pollinated variety with small tight buttons Crops December to end March. 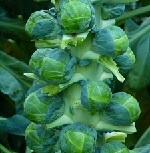 New, late season variety for harvesting from late November to the end of January.